31 August 2002: The African Bird Club invites comments on its draft Checklist of African Birds, compiled by Peter Lack. Join the AfricanBirding Yahoo Group and the MEBirdNet Yahoo Group! As with all Yahoo Group mailing lists, you may elect not to receive e-mails and instead read posted messages on the web at your convenience. Another reminder: the African Bird Club and the Ornithological Society of the Middle East need your support, so please join or renew if you have not done so already. The December 2000 issue of the Bulletin of the British Ornithologists' Club includes an outstanding article by Lincoln Fishpool entitled "A review of the status, distribution and habitat of Baumann's Greenbul Phyllastrephus baumanni." Bull. B.O.C. 2000 120(4):213-229. This little-known and easily confused greenbul has been recorded from Sierra Leone east to Nigeria. Of the 40 records, the author shows that some were clear misidentifications while others are doubtful. Of great interest is a fine color plate by Nik Borrow (illustrator of the field guide to West African birds) showing baumanni and three species with which it has been confused: Slender-billed Greenbul Andropadus gracilirostris (very close in appearance but a canopy inhabitant, while baumanni is an undergrowth skulker), White-throated Greenbul Phyllastrephus albigularis, and Brown Illadopsis Illadopsis fulvescens. All important in determining which records to accept is baumanni's habitat preference: "mid-altitude forest occurring between c.500 and 1,100 m, often on hill and mountain slopes, both within and a little way beyond the limits of the lowland forest zone. At lower altitudes (down to sea level), it mostly occurs in gallery forest and thicket on the fringes of the forest zone proper, both north, and as at Cape Coast, Ghana, south of it. Baumann's Greenbul seems to be closely tied to the forest-savanna ecotone across much of its range, entering more deeply into the lowland rainforest - secondary grassland mosaic zone only in the far west. In the Togo Mountains, along the Ghana-Togo border, it also penetrates a little way into the Sudanian woodland zone but overall it is confined throughout to a relatively narrow latitudinal range." (pp 225-226). The September 2000 issue of the Bulletin of the African Bird Club is packed with interesting information, including articles about Vermiculated Fishing Owl in Nigeria, the extinction of Aloatra Grebe in Madagascar, and identification of glossy starlings, plus various notes, including a range extension for Mt. Kube Bush-Shrike in Cameroon and the particulars on Ben Obanda, a recommended bird guide at the Kakamega Forest, Kenya. Anyone interested in African birds should join the ABC. Iran: See Jerzy D.'s note on his observation of Pleske's Groundpecker, Podoces pleskei, about 30km NW of Chahr-Babak, Kerman Province, Iran on 10 October 1999. Bahrain: A large part of the Grey Hypocolius winter roost was bulldozed on 5 April 2000. The Bahrain Bird Report website advises that the birds have moved 500 m north of the map location. Oman: Nick Gardner reports that he visited Dave Sargeant in Oman where they saw Yemen Serin, Serinus menachensis and Hume's Tawny Owl, Strix butleri at the stakeouts around Salalah in the south. Yemen: Socotra Trip Report by Dave Sargeant, with maps, photos and GPS waypoints, January 2006. Syria: Three breeding pairs and a seventh adult Bald Ibis Geronticus eremita have been discovered in central Syria. BBC, 9 July 2002. Jordan: August - September 2001 Jordan trip report by Mike Kilburn. Israel: There are photos of a Cyprus Warbler Sylvia melanothorax caught in March 2000 on the Jerusalem Bird Observatory website. Morocco: Club Med, perhaps the world's most destructive resort operator, plans to build a massive, 8000-bed, 260 ha holiday resort Tifnit, in critical habitat of the world's last remaining colony of Northern Bald Ibis, Gerontica eremita, in Souss-Massa National Park. Only 65 nesting pairs remain. Proact and Groupe d'Ornithologie du Maroc (GOMAC) are working against the project, which presumably will be financed by New York and Paris banks. DNA sequence analysis supports recognition of the Atlas Flycatcher Ficedula speculigera from the Atlas Mountains. "A new bird species? The taxonomic status of 'the Atlas Flycatcher' assessed from DNA sequence analysis" by G-P Sætre, T. Borge & T. Moum, Ibis (2001) 143: 494-497. Djibouti: In an article in the March, 1998 issue of the Bulletin of the African Bird Club entitled "Mystery birds from Djibouti", Geoff and Hilary Welch present details of apparent undescribed forms of Pytilla and Sunbird. Ethiopia: Roy Hargreaves writes to the AfricanBirding list (10/00): "With regard to the Sidamo Lark site at Negele. It is my understanding that recently this site had an army camp sited near/on it and people were being arrested when at this site - if they persisted in trying to look for the larks." The Gambia: Bird reports are posted by The Gambia Birding Group. Ghana: Proposed Halliburton Company Dam on the Black Volta River in Bui National Park: Biologist banned for knowing too much. Ivory Coast: Eating French -- literally! Nigeria: Tasso Leventis discovered around 40 Anambra Waxbills Estrilda poliopareia on the grounds of a nursing college at Tombia, southern Nigeria. The species had not been recorded since 1987. World Birdwatch 24:3 (September 2002). Three pairs of the critically endangered Ibadan Malimbe Malimbus ibadanensis have been found by Shiwua Manu on cocoa plantation just north of the the only other known site for this species, the grounds of the main International Institute of Tropical Agriculture station near Ibadan. The new site is under threat of clearance for firewood. World Birdwatch 22(3) reported in Bull. A.B.C. 8. A new species of firefinch, the Rock Firefinch, Lagonosticta sanguinodorsalis, has been described from bushy and grassy rocky outcrops on the plateau and inselbergs to the north and east. Payne, R.B., IBIS 140:368-381 (July 1998). Its songs are mimicked by its brood-parasite, the Jos Plateau Indigobird, Vidua maryae. Cameroon: March-April 2003 Trip Report by Ron Hoff. Michael Mills and Callan Cohen have posted their February - March 2002 trip report with bird photos, including a singing Mt. Kupé Bush-shrike, on birding-africa.com. March 2001 Trip Report by Charles Davies - Mt. Cameroon, Mt. Kupé, Bamenda Highlands. A bird believed to be Prigogine's Nightjar, Caprimulgus "prigoginei", has been tape recorded in fairly dense forest 1.2 km east of Boulou camp (Lobéké) and the call heard in forest in Nki (Mala) and Kupandaka. The same voice was taped at Itombwe, E. Congo-Kinshasa, the site of the type specimen, and at Ndoki in Congo-Brazzaville. See "New species and amendments to the avifauna of Cameroon", by R.J. Dowsett & F. Dowsett-Lemaire. Bull. B.O.C. 120(3):179-185 (September 2000). The Cameroon list now stands at 908 species. Greenpeace report: Plundering Cameroon's rainforests: A case study on illegal logging by the Lebanese logging company Hazim. 7 September 2000. (pdf). "More than half of Cameroon's timber ends up in EU countries, yet consumers and governments seem to be unaware of the large scale illegal logging in Cameroon and the social and environmental effects of these destructive operations." Congo-Brazzaville (formerly French): Rod Cassidy's report of a mammal trip including some birding, with his bird list. (August 2001). See Bull. A.B.C. 8(1): 57-58 (2001) for a report on recent records of Loango Slender-billed Weaver and a handheld photo. "Little-known African bird: observations on Loango Slender-billed Weaver Ploceus subpersonatus in Congo-Brazzaville." By Pierre Bulens & R.J. Dowsett. MALIMBUS 20:1 (April 1998) includes an important article by F. Dowsett-Lemaire and R.J. Dowsett entitled "Further additions to and deletions from the avifauna of Congo-Brazzaville." (pp. 15-32). Most of the records are based on the authors' field work at the Odzala and Nouabalé-Ndoki National Parks between 1993 and 1997. Some of the highlights included: Black-backed Cloud Cisticola, Cisticola eximius - a newly-discovered population with different vocalizations than the birds taped in Chad and Nigeria by Chappuis (1974); Grant's Bluebill, Spermophaga poliogenys - three birds mist-netted in the understorey of Gilbertiodendron forest on the edge of swamp forest at Nouabalé-Ndoki, the small size and red head of the males are diagnostic, and the female's calls upon release, soft thac, thac, were very different from the metallic pit, pit of Bluebill, S. haematina; Grey-headed Broadbill, Smithornis sharpei, found in swamp forest and in closed-canopy dry-land forest, at much lower levels than its more common relative, Rufous-sided Broadbill, S. rufolateralis; Sandy Scops Owl, Otus icterorhynchus - this little-known species was found in open-canopy forest (1) 10 km east of Bombassa (captive bird), (2) Bomassa Camp (heard), and (3) along the track from Bomassa to Ndoki Camp (heard). 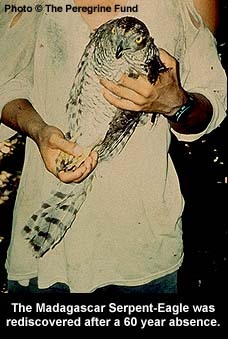 One bird called apparently in response to playback of Fraser's Eagle Owl, Bubo poensis, as had two individuals found in the adjacent Lobéké Reserve of SE Cameroon; possible Itombwe Nightjar, Caprimulgus prigoginei - tape recorded in open-canopy, dry-land forest in Nouabalé-Ndoki. "The song is a dry staccato somewhat reminiscent of that of C. natalensis, but lower-pitched, of a different timbre, and delivered a little faster." It is identical to a tape obtained by T. Butynski in the Itombwe forest, whence came the only known specimen of C. prigoginei. MALIMUS, the Journal of the West African Ornithological Society, is a particularly good value, and I would urge twitchers to support West African ornithology by subscribing, at £10, from the Treasurer, R.E. Sharland, 1, Fishers Heron, East Mills, Fordingbridge, Hants. SP6 2JR, England. Congo-Kinshasa (formerly Belgian): An important paper supplementing Dowsett (1993) and Lippens & Wille (1976) adds 12 species to the country list, describes range extensions in the country, and provides new information on rare and little-known species. "Additions and annotations to the avifauna of Congo-Kinshasa (ex-Zaïre)", by Ron Demey, Paul Herroelen & Tommy Pedersen. Bull. B.O.C. 120(3):154-172 (September 2000). Burundi: Police arrest a radio-collared White Stork as a "spy." (They probably think it's a Tutsi witch.) IOL, 5 October 2001. Kenya: The December 2001 - January 2002 report by Duan Biggs on birding-africa.com has good logistical details. Tanzania & Eastern Kenya Trip Report by Jon Hornbuckle, August - September 2001. Reports by the BBC and the Kenya Wildlife Service on a major die-off of Lesser Flamingos, Phoeniconaias minor, at Lake Bogoria. A study of the East Coast Akalat, Sheppardia gunningi sokokensis, found the species to be more abundant than previously thought, with an estimated 7,500 to 9,000 territories in the Arabuko-Sokoke Forest alone. The Akalat prefers areas where the undergrowth is partially open with large amounts of dead wood, foraging near the ground. Erwin Nemeth & Leon Bennun, Bird Conservation International 10(2):115-130 (June 2000). Nik Borrow reports on the AfricanBirding list that both David Ngala and Alex Mwinga are first-class guides in the Sokoke Forest and that arrangements may be made at the visitors' center near Watamu. Uganda: Rwanda & Uganda Birding Trip Report by Dave Sargeant & Nigel Moorhouse, June 2003, with maps and GPS waypoints. Jon Hornbuckle's report of a trip in July - August 2001.
each visitor and hopefully not have to do such work. The site is 10 minutes from Bohoma camp site and the safari lodges." A two-week survey of wetland sites in Uganda found only 19 Shoebills, Balaeniceps rex. Uganda had been thought to have up to 600. Bird Conservation International 8(2):208 (1998), citing Naturalist 2.1, 3. Tanzania: Pamela Beresford, Jon Fjeldså, & Jacob Kiure. A new species of Akalat (Sheppardia) narrowly endemic in the Eastern Arc of Tanzania. The Auk 121(2):23-24 (January 2004). The Rubeho Akalat, Sheppardia aurantiithorax. Angola: A six-day expedition to northern Angola in January 2005 by Ian Sinclair et al. succeeded in relocating Orange-breasted Bush-shrike Laniarius brauni, White-headed Robin-chat Cossypha heinrichi, and Black-tailed Cisticola Cisticola melanurus. BirdLife, 20 April 2005. Zambia: Zambia & Northeast Namibia Birding Trip by Jon Hornbuckle, October 2003. A census of the Bangwulu Swamp by the Zambian Ornithological Society in 1995 found only 44 Shoebills, Balaeniceps rex. G. Renson, Alauda 66(2):81-96. Zimbabwe: Should be avoided until further notice, as the natives are armed, dangerous, and running amok. See "Connecticut man killed in Zimbabwe tried to help children there." AP, 12 November 2002. Botswana: In what has been described as a "farcical meeting" by a member of BirdLife Botswana, on 19 October 2000 the government disclosed plans for aerial spraying of the toxic pesticide Endosulfan over 7,180 square kilometers of the Okavango Delta starting in May, 2001 for tsetse fly control. This is a continuation of the 15-year campaign funded by the United Nations Food & Agriculture Organization (FAO) to convert the Okavango from wildlife to large-scale cattle ranching. Due to gross incompetence, odor-baited targets, which have been used successfully against tsetse flies in other African countries, have not been properly maintained in Botswana. Namibia: Vulture population on verge of extinction. Namibian, 22 February 2001: Only 8 Cape Griffons are left in Namibia due to widespread anti-predator poisoning. In 1996, a single farmer killed 10% of the Namibian Lappet-faced Vulture population. South Africa: Kimberly Pipit, Anthus pseudosimilis, a new species, has been described from South Africa. Liversidge & Voelker, Bull. B.O.C. 122(2): 93-109. Although initially confused with Long-tailed Pipit, it has been found to be most closely related to Malindi Pipit, A. melindae, of coastal Kenya. The first confirmed Chatham Island Albatross Diomedea (cauta) eremita for Africa was found on a Cape pelagic trip on 27 May 2001. See photos on zestforbirds.co.za. Trip report by Mike Hunter, October 2000. A new edition of the Wakkerstroom Bird & Nature Guide, by Warwick and Michele Tarboton, is available from the Wild Turkey on Church Square (Box 289, Wakkerstroom 2480). It is indispensable for any birder going there. Wakkerstroom, in eastern Transvaal, is one of the most interesting birding sites in South Africa. 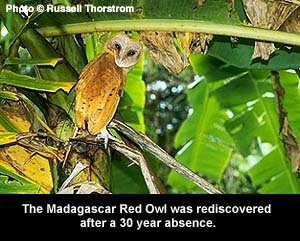 Madagascar: The Madagascar Red Owl Tyto soumagnei, formerly known only from the northeast, has been found in primary rainforest in southeast Madagascar in the Kalambatritra Special Reserve. M.T. Irwin & K.E. Samonds. Ibis 144:680-683 (2002). Other rare birds known from Kalambatritra are Grey-crowned Greenbul Bernieria cinereiceps and Slender-billed Flufftail Sarothrura watersi. Handheld photos of the new warbler, Cryptosylvicola randrianasoloi, described from the eastern rain forest of Madagascar in Ibis (1996) 138:153-159, have been posted on the BOU Website. Grand Comore (Comoros Islands): Grand Comore Trip Report by Peter Kaestner. Peter Kaestner, whose world bird list ranks first and continues to grow among active birders, recently visited Grand Comore. He has written a concise report with important details about finding choice endemics, where to stay, and which guides to hire. Moheli, Comoros: A new scops owl, the Moheli Scops Owl, Otus moheliensis, has been described. World Birdwatch 20(4): 7. UK: Surely the British twitch of the Century was the SLENDER-BILLED CURLEW, Numenius tenuirostris at Druridge Bay, Northumberland during 4-7 May 1998. After an exhaustive inquiry, the record was confirmed by the British Ornithologists' Union Records Committee on 24 January 2002. See BirdGuides for details and a freeze frame from video footage of the bird. British Birds Rarities Committee press releases | Surfbirds page. "First European bird to become extinct for 150 years", by Brian Unwin. The Independent, 10 February 1999. Poland: Help preserve and protect Bialowieza Forest.